In a past post, I noted how tax arrears in Greece were both high as well as highly concentrated (here). The General Secretariat for Information Systems (GSIS) has just published a detailed list of the corporate entities that owe more than €150,000 in tax arrears. 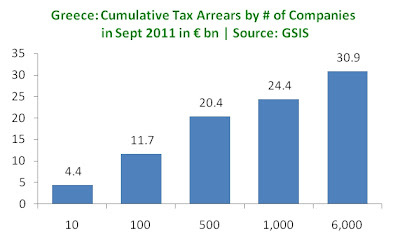 There are 6,000 companies on the list with arrears of €30.9 bn. There is not much new to say (see my previous post) except to underscore just how skewed the data is: 10 companies alone owe €4.4 bn with train company OSE leading the way; the top 100 companies owe €11.7 bn. Of the 6,000 companies with arrears, 212 make up 50% of the total. No doubt the publication of the names will produce both pressure as well as intense reaction. Will it help with tax collection? We'll see. Thanks for the post Niko. Interesting question whether this will improve tax collection. I'm sure you read a few weeks ago about the Financial Crimes Squad paying surprise visits to the Greek islands. In Rhodes, 11 out of 11 business that were checked were found to be owing taxes. I wonder if any of the personnel at that local tax office in Rhodes were fired after this (BTW, Rhodes was just one of the many islands). If not, then I suspect that tax collection measures will not improve. It may just be that Greece needs to hit absolute rock bottom. Ok - so a list has been printed- what next? Will they do something to collect the taxes owed? Doubtful! As a shop owner in Greece it saddens me to see that PINK and Artisti Italiani are high of the list ... no doubt these stores will remain open while the small businesses with fully paid tax will be forced to close in the very near future. Foe a country that 'invented' democracy - there's not much evidence of it! Nikos, What's happening? There are rumours all around that Greece is defaulting this week, what is going on? 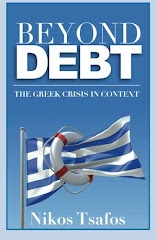 Is it true that Greece will run out of money by October the 17th? Please give us some information about that. Thanks for your blog, I'm recommending it to all my jobmates. It is a sad state of affairs the world is in. Sadly completely predictable from the raise in the standard of living of the third world economies, nobody ever mentions the the global economy is very close to a zero sum game, meaning, what one gains another looses. Since most of the world resources were being utilized by the G7, when the BRICS started to grow exponentially, what did you expect? Where were the resources they use come from? This is creating huge instabilities in all the developed Countries, as their industrial machines need to shift their focus from internal consumptions of a consumer that will be "relatively" impoverished more and more to a different type of world. For instance in Cornell University most of the best applicants were from Asia with perfect 800 scores in the SAT (test that is supposed to indicate scholarship proficiency and only rare geniuses are suppose to be able to ace it). Good set of data, but increased tax collection will not prevent Greece from escalating into a deflationary spiral. These are symptoms rather than root causes of the disease. The issue (as you have pointed out earlier) is the lack of possibility to adapt monetary policy to local economic conditions, due to a common currency. Thus the dynamics are very similar to those of the Great Recession of the 1930s, where the gold standard prevented any kind of quantitative easing. Backward rationalization around taxes is unproductive and a distraction from the real issue, there are tax cheaters in any country (for example, even in countries like Norway, the black economy is estimated at around 20% of the GDP). Reading some of the comments posted on this blog is saddening...this is part of fundamental structural problem concerning the Euro and the European union. Let us discuss the decease folks, not the symptoms! And sometime soon pleas, at least before the decease spreads to the entire body!